In my mind, “jinx” can mean two things…. 1.) someone is about to give me a coke (but I’d really prefer a Diet) because I called “jinx” first, and 2.) something is coming back to bite me in the rear because I dared to brag about something. While a diet coke is what I really could go for right now, I’m experiencing the other “jinx” meaning. Bummer. Remember my post a couple of weeks ago about our awesome Behavior Motivator? Well, when I wrote that, the boys had gone to bed easily, and earned their smiley face, for 15 out of 16 nights. Things were clearly going awesome, so even though I knew in the back of my mind that I really shouldn’t blog about it until after they had met the 25 smiley face goal, I did it any way. Silly, silly, Helen. After that blog post, things went downhill in a hurry. As in, so downhill that we eventually told the boys that we were taking a break for the remainder of May (only another week or so) and would start completely over in June. On Saturday night, we sat the fellas down and reminded them of the rules. Everyone has to stay in bed and be quiet in order to earn a smiley face. If even one person throws a fit, and/or comes out of their room too much then no smiley face for the group. 25 smileys means bunk beds, and if they stay on track that means they’ll earn them by the end of the month! So Saturday and Sunday night were great! Two smiley faces added to the calendar, 23 to go! Monday night none of them stayed in bed. Last night, while they sort of stayed in their room, they most certainly did not go to bed easily. I give you exhibit A.
Yep. I see some hard labor ahead of the boys this morning. Such a bummer of a way to spend a nice, summer day. Let me be clear here about what went down in this disaster of a room. When they went to bed last night, their beds were not pushed together to make one giant bed, and the books were all neatly on the bookshelf. (This morning the sheets came off and the clothes go thrown around.) So the boys managed to move their beds around last night (and switch who slept in which bed), but they also threw books around the room. 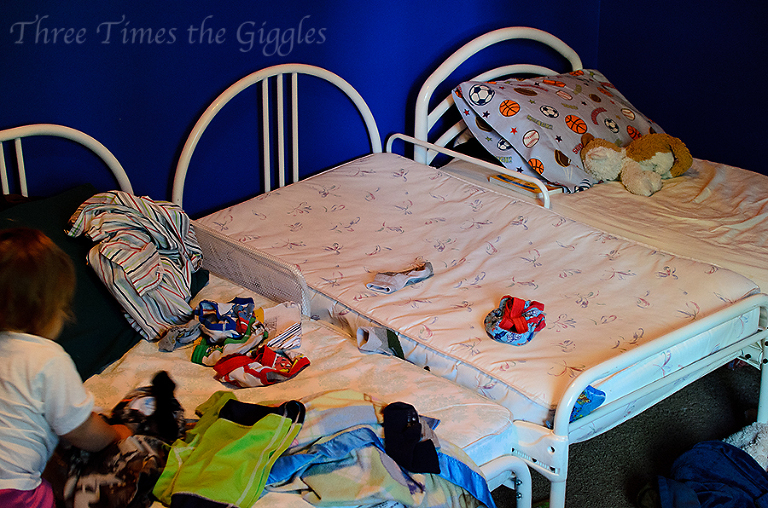 The sheets are off two beds because of a couple of mild accidents, but that wouldn’t count against the smiley faces. Accidents happen and we get that. 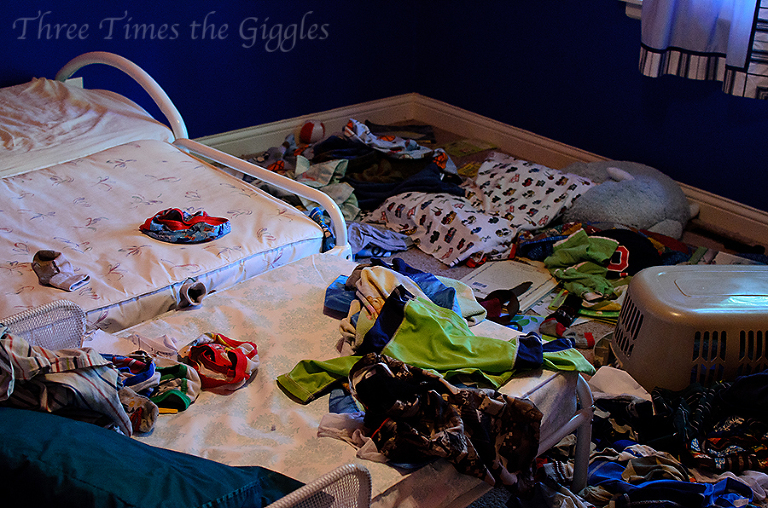 The clothes are all over the room courtesy of Tyler and a tantrum that continued when we put him in his room this morning to chill out. Apparently he chills out by emptying drawers. So there you have it. Not only are my children (and subsequently my home) un-perfect, but I managed to jinx myself by blogging about how awesome my bribe plan was. Silly, silly, me.